Owls is nocturnal animals species that feed for the night. They perched on the branches of the tree quietly while waiting for the passing prey. Flat faces and hideous blank stare are a special feature of this creature. Every night they make a sound like a hiccup, this sound sometimes gives a frightening mystical scent. Owls themselves are often associated with the mystical animals associated with spirits. Some cultures even consider owls a bad omen. If seen from this animal science just like any other bird, but there are some amazing facts surrounding this bird. 1 | Owls can rotate the head 270 degrees. 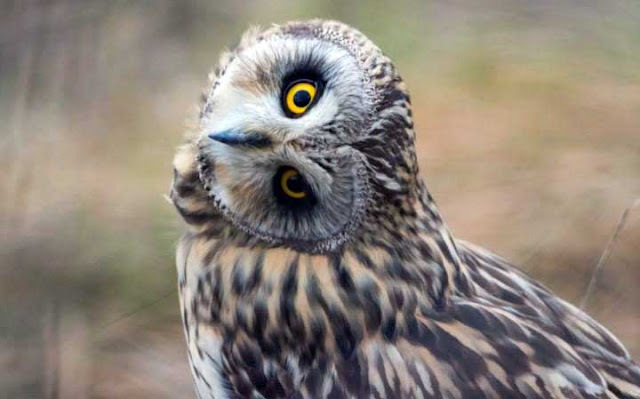 It used to be a myth that owls could turn their heads 360 degrees. But based on recent research, Owls are only able to turn heads maximum 270 degrees. But this is quite amazing, with this ability they are able to turn the head facing backward. This ability is supported by the bone structure, the muscle that enables this animal to turn the head in the extreme without blocking blood flow to the brain. 2 | Owls have sharp eyes. Sharp eyes are very helpful owls to search for prey from a distance. The size of their large eyes is also very helpful to see the prey at night. Uniquely owl eyes are not spherical but rather bebentuk tubes that blend with the bone. So the eyes of the owl still can not glance here and there. Therefore, they only rely on the flexibility of his neck to glance here and there. 3 | Owls have sharp hearing. Owls can detect wherever the prey is hiding, whether behind the leaves, twigs, or under the ground. They rely on the hearing ability that is helped by their face shape. So when they turn to a particular location it can focus on certain sound waves. The feathers around their faces can also help detect and distinguish the very soft sound waves produced by the prey. 4 | Owls fly silently. This advantage is very useful for the owl to prey behind the silence of the night. The prey will not be aware of the owl's predation. This remarkable ability lies in the small structure of the feathers around its wings. This structure resembles hooks and arrows that break the air into small streams. So it is more aerodynamic and less noise caused by air turbulence. 5 | Owls can camouflage. Like a chameleon, it turns out the owl can also camouflage. They can adjust according to the environment in which they perch. The owl's camouflage ability aims to avoid prey during the daytime during sleep. Textures and patterns on their feathers play an important role in camouflage. Owls that live in the trees will have the same color and pattern with the tree's pattern. 6 | Owls can prey on large animals. Owls that can prey on large animals are usually large owl species such as Eagle Owl. They are able to prey on deer, goats, wolves or other large mammals. They can prey on easily because they are supported by a large body size with wingspan that can reach 2 meters. Not only are they also fond of mammals eating fellow owls, especially those of the same size or smaller. 7 | A terrible owl sound. The sound of an owl is one of the voices that some people besides crows raise. Sound like hiccups many times, in the middle of the night is always considered a bad sign. There are even people of Java who say if we imitate his voice and not answered then there will be people who died the next few days. Often the sound of an owl is also associated with the voice of the spirit caller of spirit or demons.